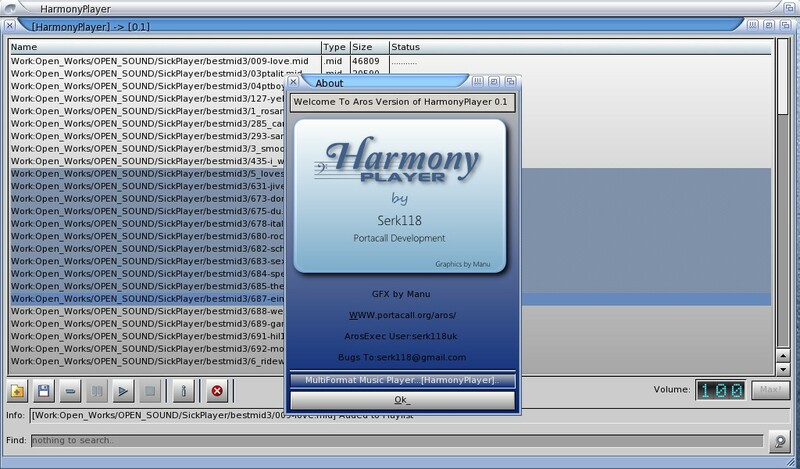 Great news for arosians as our very own member serk118uk started a completely new project called HarmonyPlayer, and serk118uk was so kind to share his development-cycle. HarmonyPlayer is a multiformat audio-player for Aros, and has a very stylish Zune-interface which can be skinned as well. This very first release has graphics that were created by Manu (one of Aros' very talented graphics artists), and has a very easy to use playlist-interface. The player has an auto-update function as well, so that you can always keep it up-to-date. 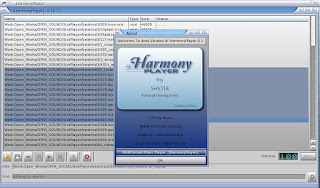 HarmonyPlayer supports playing the following formats: 669 (Composer 669, Unis 669), AMF (DSMI Advanced Module Format), AMF (ASYLUM Music Format V1.0), APUN (APlayer), DSM (DSIK internal format), FAR (Farandole Composer), GDM (General DigiMusic), IT (Impulse Tracker), IMF (Imago Orpheus), MOD (15 and 31 instruments), MED (OctaMED), MTM (MultiTracker Module editor), OKT (Amiga Oktalyzer), S3M (Scream Tracker 3), STM (Scream Tracker), STX (Scream Tracker Music Interface Kit), ULT (UltraTracker), UNI (MikMod), XM (FastTracker 2), Ogg (Vorbis audio format), Flac (Flac audio format), Wav (wav audio format), Mid (midi format via timidity) and Mp3. In order to be able to play midi-files, a timidity assign is needed to the timidy patches. Please keep in mind this is a WIP, so the audioplayer may actually display unexpected behaviour. Anything you want to share about this player can be done in the thread that is linked below. Any thoughts are appreciated although serk118uk is limited in his time.